Today is Halloween. I am at Go Like The Wind School in Ann Arbor. I spend Monday through Thursday here teaching music and helping out with the Middle school classroom. Normaly on Tuesdays I teach general Music to the 1st-3rd graders, however, since it is Halloween, the students are eating candy and going crazy. The middle school students brought a ton of sweets, so I am now sitting here with a belly full of sugar and no music to teach. What a great time for a blog entry! The time with Pandit Samar Saha was so refreshing and inspiring. I had lessons with him on Tuesday and Thursday and then drove him to a house concert on Friday. It was a great week. He is one of the best musicians I have ever watched perform, and one of my most influential teachers. 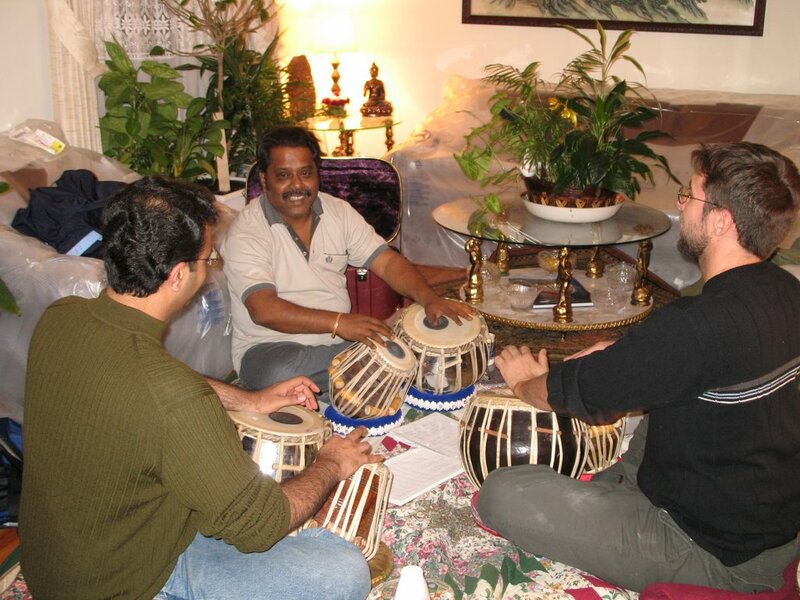 He is the person responsible for the Tabla Festival I went to in Calcutta last December. 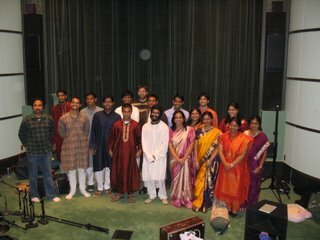 It was a concert for his Guru, who passed away 10 years earlier. Now he was on a U.S. tour with a vocalist. The concert on Friday was the first of the last 3 concerts for his tour. 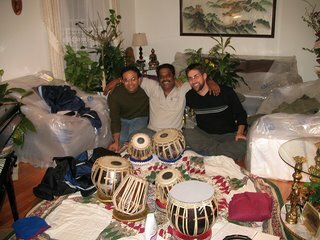 In one of the lessons he told me he had a tabla for sale that he did not need any more and did not want to fly back with. I bought before he said another word. It sounds so sweet! The lessons were great. He said he saw improvement in my hands and then he said I need to practice every day. Although I do practice a lot, I do not spend everyday with the same instrument. I took it as a challenge to practice tabla every day for the next year. A scary proposition indeed, but so far so good! Wish me luck on the next 11 months. It was great to have lessons all week and then follow it up with a concert on Friday. 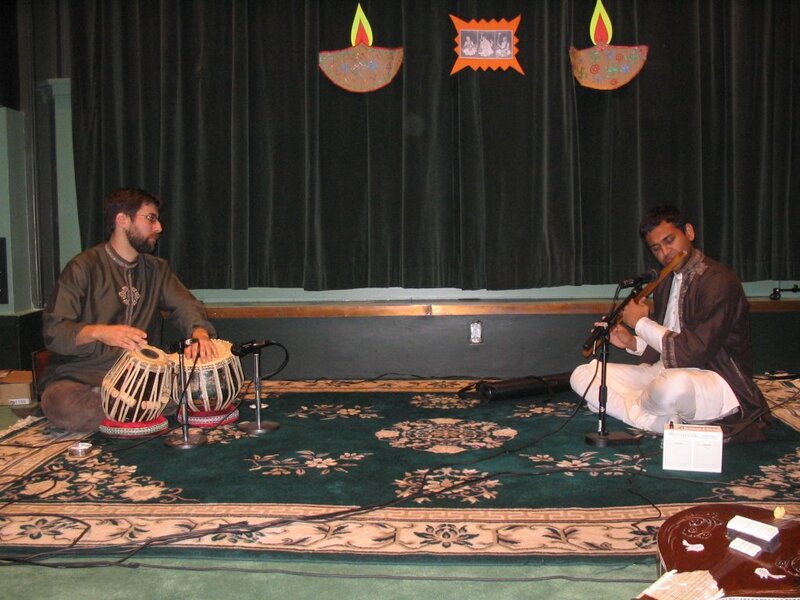 The only other time I have seen Samar Saha perform is when I was on stage with him at the Macintosh Theater at the U of M music school just over 2 years ago. I had been taking lessons with him the whole week, just like this last time. 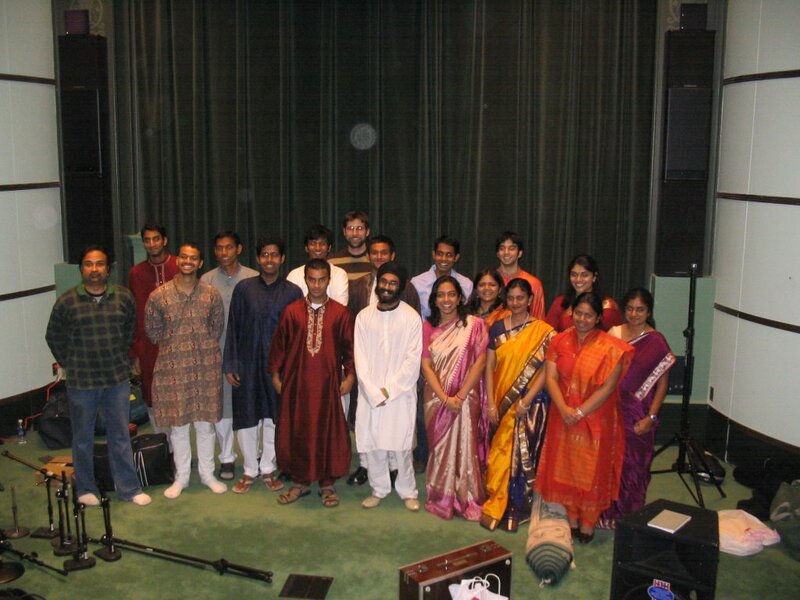 He was supposed to perform a concert at the end of the week with Sitarist Kushal Das, (whom I saw perform in Calcutta [check out the December 05' blog!]). As it turned out, Kushal Das got really sick in Chicago and could not make it to the AA show. Without hesitation Samar Saha asked Ajit Acharya and myself to accompany him on stage. I was genuinely terrified for the first time in my professional career. I felt like I had no business on stage with such a great performer. From what I remember of the concert it went well and I praise and thank him to this day for asking me on stage. It opened my eyes to a 'big stage' experience and gave me a front row seat to one of the great tabla players alive in the world today as he performed an incredible solo. I have considered him my Guruji ever since. 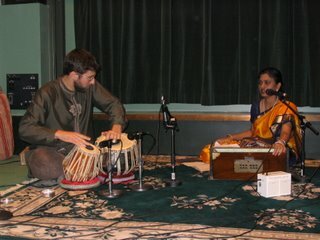 The following week I was rehearsing for the upcoming Indian Classical Music and Dance performance at the University of Michigan. The timing of the show could not be better. I performed the concert on Friday. Both my Mom and sister were in town and came out to support me along with my wife Jody. It was great to have them there. Compared to the drumset, I have not perfromed tabla very much and it felt great to have my biggest fans in the audience. I performed one piece with my friend, a flute player named Chetainya, (it took me 4 months to learn how to pronounce his name!). I also perfromed with a vocalist named Meghna. It was a fun show, and good to see some old friends from past ICMD shows. The next day I was rehearsing with The Gratitude Steel Band in their new rehearsal/office space. We were prepairing for a 20 minute showcase gig at the Grand Traverse Lodge in Traverse City. The showcase was for the Michigan Festivals and Events organization. I am not sure what the actuall name of the organization was, but the convention was filled with musicians, entertainers, party suppliers, and anything that has to do with the big festivals in Michigan. We performed a giant medly that ended up being 19 songs long and included Hawaiian dancers. The show went so smooth. It was a great boost for the band to put on such a powerful show. This band has always been great at listening, changing, and moulding the music being made on stage to fit with the mood of the band and the audience. 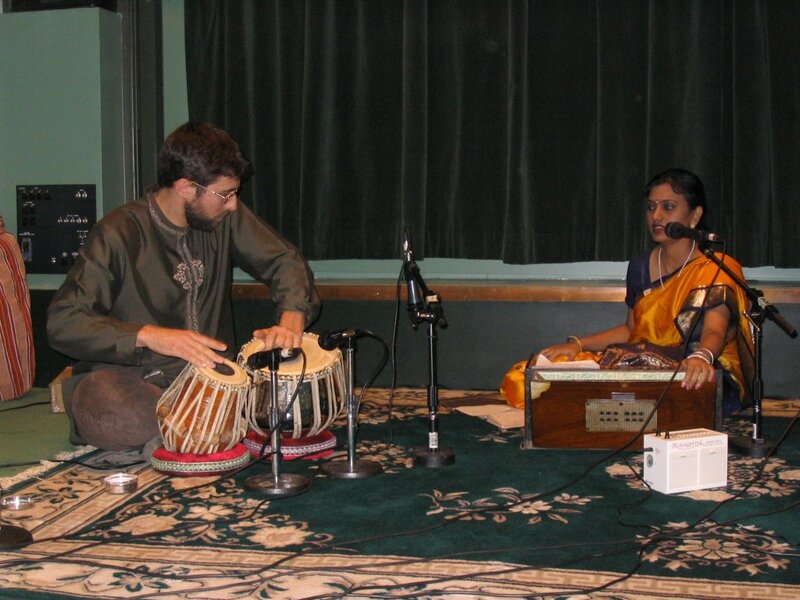 I see a strong link between the way they make music and the musical philosophies of Indian Classical players. Improvisation within the structure of the music being played sounds like a great idea, but is not easy to pull off. Gratitude does it nicely. I am not sure how much work we will get out of the showcase, but I am sure I will write about it. That brings me up to date so far. A couple of gigs coming up this weekend. One in Ann Arbor with a poet and one in Bronson, MI. with rock band Paledave. In the meantime I have stopped doing my Monday night workshops at Oz's Music Environment and have moved my private lessons to my home studio. I had a great time teaching at Oz's and look forward to working with Steve in the future. But for now, it feels good to be at home. I have dreamed about having a home studio for the past 5 years and now I have it and it feels great! I have attached my farewell e-mail to all those who are on my e-mail list to avoid repeating myself. Thanks for reading and I will write again soon. matter what walk of life they are on, and learn to play great music.